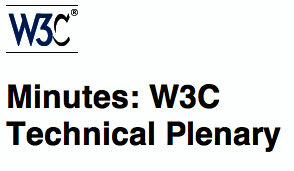 The W3C have published the minutes from the W3C Technical Plenary which includes photos from the Flickr Pool. All in all, a nice record of the day. A Whatfettle article by Paul Downey published Thursday, March 24th, 2005, at 9:06 am under a Creative Commons License.